Probably everyone who has enjoyed a good Western novel by the likes of Zane Grey or Louis L’Amour has dreamt of taking a long cross country ride on horseback.To paraphrase Louis L’Amour, it’s about ‘seeing the country slowly, through a horse’s ears’, with little more than a bedroll, a can of jerky and a bag of oats. The romance of traversing the landscape with a powerful steed sits deep within many of us. This adventure is exactly what Lloyd Gillespie and Isabel Wolf have undertaken. Having left from Durban in July 2009, they headed north to the Mozambique border, around Swaziland, through Mpumalanga to the Limpopo before heading west along the Limpopo, all the way to Alexander Bay on the west coast. From there they turned south, and, over 5 500km later, arrived in Cape Town this week before taking on the last leg of the journey back to Durban. But Gillespie and Wolf aren’t simply in it for the adventure (although they admit that is undeniably a part of it), they are aiming to create awareness of and raise money for, the treatment of African Horse Sickness – an endemic and often fatal disease affecting equines – and to attract corporate and private funding for a planned future Equine Welfare Project they intend to set up in the former Transkei. Gillespie, who runs Fishriver Horse Safaris and The Haven Horse Safaris on the Wild Coast, where Wolf joined him after coming to South Africa from Germany in 2008, said horses and other equines in the country were often subject to abuse and ill-treatment, particularly in rural areas. This was often out of ignorance rather than maliciousness, he said, but was “saddening” nonetheless. Looking for a way to help both horses and humans, the idea of an Equine Welfare Project was born, a place where equines could be vaccinated, dewormed and medicated; where training courses could be held to give local people the skills to work in any of the numerous equine industries; and where equine therapy sessions could be conducted for survivors of trauma and troubled children and adults. But it was African Horse Sickness (AHS) that sparked the journey. 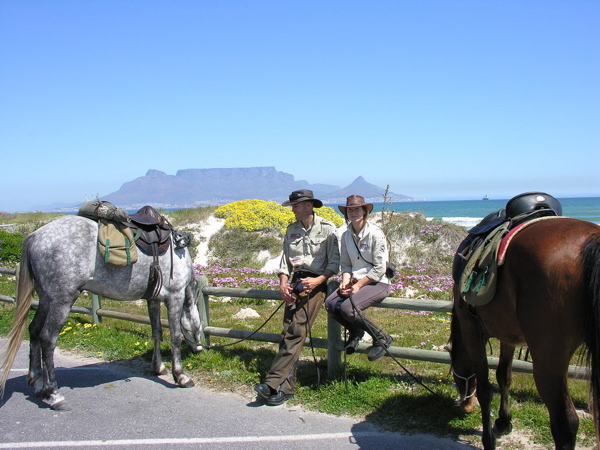 While on a 350km ride from Port Alfred to The Haven in 2008, two of the horses back home got infected with AHS. Distraught and desperate to save their beloved animals, Gillespie and Wolf got in contact with the African Horse Sickness Trust. After pulling their horses through, the couple investigated the possibility of implementing a vaccination programme. With the help of the AHS Trust chairman Douglas Welsh they managed to distribute 600 vaccines which, at a R100 each, was a valuable contribution. So while spreading the word and raising money to combat AHS was the initial idea of their Riding for Horses project, “when the ride started we realised it’s not just AHS we should look at”, said Gillespie, there was a bigger picture of education and skills development. As for raising funds, while some companies have come to the fore, such as Equi-Feeds and Trinity Asset Management, the Cape Town to Durban leg lying ahead was “the business end” of the ride, said Gillespie. And it’s certainly been a walk that few people in the modern age get to experience. The logistics are only one part of it, and much of the trip has been about putting their faith in other people’s assistance. There is no back-up team, just Gillespie, Wolf, their ridgeback Pula and a Toyota Hilux bakkie that acts as a “travelling warehouse” and is used to drop bales of feed off on the route ahead. With Gillespie and Wolf on horseback, they are reliant on volunteers to move their bakkie ahead for them. And when they’ll get to that next point is not a given. Horses get tired, they can get sick, they might not feel like walking on a particular day. Thus the riders have spent many a night in the open bush, although, just as often, they have been invited in by local farmers, given a hearty meal and a bed. “People help us along the way, feed us, welcome us into their home. A farmer puts you in touch with the next farmer, and so it goes. The horses build the bridge,” said Gillespie. “People see you ride up on horses and they’re like ‘ah, you’re riding horses, how lovely’,” said Wolf. And although they’ve experienced tough times: riding through the heat of summer in Limpopo, getting bitten by ticks, dodging poisonous snakes, the sense of freedom is incomparable. “Walking through the landscape, moving 30km (on a good) day, you become part of your environment…you…connect to things, hear the birds, feel the sun…the timeless drumbeat of motion, quietness, solitude,” muses Gillespie. One of the highlights of their journey so far, says Gillespie, was, genuinely, seeing Table Mountain as they came down the R27. But the R27 was also a nightmare. Not being able to go through the West Coast National Park, they led the horses along the side of the road last Sunday at the end of the long weekend. “It’s the busiest road we’ve ever encountered,” said Gillespie. And the verge next to the road was pitted with mole holes so they had to lead the horses or risk them being injured. Add to that numerous sightings of the deadly Cape Cobra on the verge and it was a matter of risking life close to the road or risking life close to the fence. Another memorable occasion was smelling the sea for the first time in months as they approached Alexander Bay after coming out of the Richtersveldt. And the Kalahari, “the Bushman grass, red earth and rolling hills,” says Gillespie. And the Kalahari Truffles the farmers served up for them, adds Wolf. And should all work as planned, the pair have grand plans to improve life for horses and revitalise the equine industry in South Africa.